Groves was referring to a lawsuit brought against the city by Councilman Butch Calvert. 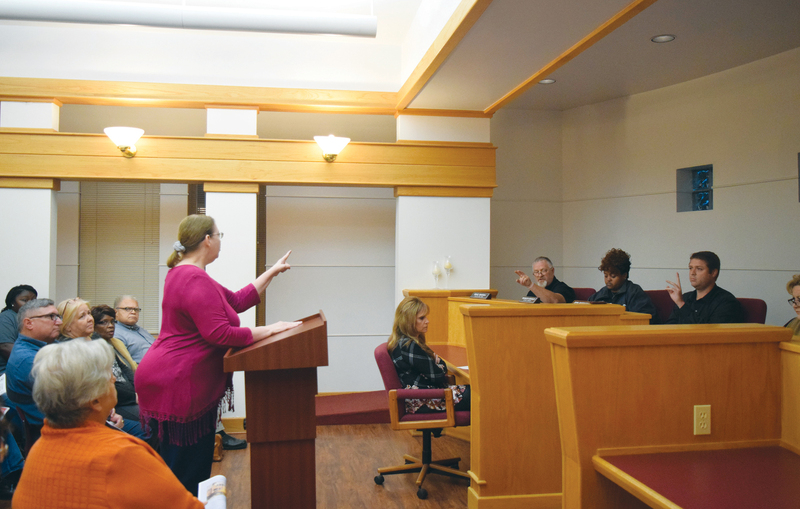 Calvert sued the city after a legal petition to place an up or down vote concerning the Crockett Economic and Industrial Development Corporation on the November ballot was rejected by the council. A petition was recently circulated to have the measure placed on the November ballot in an attempt to dissolve the CEIDC. The petition required 361 signatures (10 percent of Crockett’s registered voters) to be placed on the ballot. It received 373. Following Groves’ address to the council, Crocket resident Virginia Lewis spoke to the council and reasoned because City Attorney Bill Pemberton had recused himself from the CEIDC lawsuit citing Rule 3.01 of the Texas Disciplinary Rules of Professional Conduct, it had cost the city approximately $30,000 to retain the services of outside counsel. Lewis commented Calvert had informed the council about the legality of the petition despite heated objections from other council members and added the state had also weighed in on the legality of the petition. “I don’t know. We have a $20 or $30,000 bill we have to pay a lawyer. If you really want to do what’s right – I don’t think we (residents of Crockett) were represented here. I think probably two or three people were represented. I want to thank you Mr. Calvert for speaking up for what’s right for the people. Over 300 people signed that petition. They had a voice and a right but because we are divided, you moved ahead without going back to your council and saying how can we resolve this. Now, the taxpayers are stuck with paying that bill (legal fees),” Lewis said. The city hired Houston-based attorney Carroll G. Robinson. Robinson is affiliated with the Robinson Law Group in Houston and the Rosen Law Firm in New York. His retainer is $3,000 and his fee schedule is $250 per hour for his services, $100 per hour for legal associates and $15 per hour for administrative assistants. Lewis was followed by Teri Meadows, a former member of the now-defunct Keep Crockett Beautiful organization, who donated $662.48 from the organization’s bank account to the city’s Parks Department. As the public forum continued, CEIDC Board Member Karen Duncan followed Meadows and questioned the city’s logic in the November 2017 sale of the former state school/Cornerstone/Serenity Place property to Crockett ISD. “I do have a concern and I don’t want anyone on the council to be defensive because that is not what this comment is meant to be about. It’s just meant to say that there needs to be some transparency because the state school facility was sold to CISD,” she said. Citing information obtained from Councilman Darrell Jones, Duncan rehashed the sale. Once Serenity had cleared out of the facility, CISD expressed interest in purchasing the campus. Another group, hoping to install a residential treatment facility (RTC) at the 1701 SW Loop 304 location, had also expressed interest in purchasing the facility. The second organization known as Brain Nation, a charter school, had hopes of partnering with Hands of Healing – an RTC – to purchase and re-open the facility. CISD offered $650,000 for the facility in one lump sum while Brain Nation offered $750,000 in three payments. Given the history of the repeated closures of the former state school facility, the council voted 3-2 in favor of the CISD purchase. Duncan rattled off several financial figures showing how putting in Brain Nation would have benefitted the city more, but failed to bring up the unsuccessful ventures of Cornerstone and Serenity, companies very similar in scope to Brain Nation and Hands of Healing. When Marsh began to respond, Duncan continually talked over the mayor pro tem. Despite being told time was up, Duncan did not cease talking until Crockett Police Chief David “Buddy” Cross informed her the allotted time to speak was over. She continued to speak until a second police officer requested she leave the council chambers. “That’s what you told me. You said there were two lawsuits,” Jones said. “You told me there were lawsuits,” Jones responded. “(Let’s) see it in writing,” Jones said. “I don’t know why these questions aren’t asked directly to me if you have concerns about it,” Angerstein said. “Well, you told me when I asked you that we were in lawsuits,” Jones continued. The back-and-forth continued until Mayor Joni Clonts moved the meeting on to the next agenda item.